A Classical Guitarist will add ambiance to your wedding reception or dinner, performing a subtle but interesting programme of music, including many of the popular classics associated with the guitar. 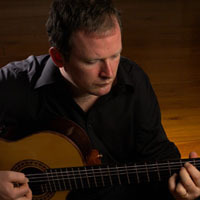 Among these, is the world famous second movement from Rodrigo’s Guitar Concerto (Concierto de Aranjuez, adagio), pieces by the great composers including Vivaldi and Bach, through to contemporary music such as Cavatina and other popular Latin standards. Arrangements that utilise the versatility that is natural to the guitar. Other similar ensembles for consideration include: Solo Violinist, Harpist.